Tradition Miso is a dedicated Miso producer, our miso is handled by distributors who deliver the Miso to retailers throughout Eastern Canada. Retailers - please contact us at the addresses below and we will be happy to put you in touch with the distributor for your area. Consumers - can find Tradition Miso at most health food stores in Eastern Canada. If your favourite store does not carry it yet, ask them for it! 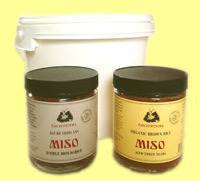 Ask us too and we will do our very best to see that you are supplied with the very best miso... Tradition Miso! Special Orders can be shipped across Canada during the cooler months of the year. Tradition Miso is packaged in 450g glass jars or available in 9 lb pails. Tradition Miso est disponible en récipients de verre de 450g et aussi disponible en seaux de 9 lb.